We are at the hospital and waiting for our turn. Tehilla was very scared this morning when we told her that she had an appointment. We talked the entire drive over and she has been very calm and putting up very little fight. She had her vitals taken and her oxygen saturation was 88! Her heart rate was 70. We are waiting patiently while Tehilla unpacks my purse and decides what should be thrown out. 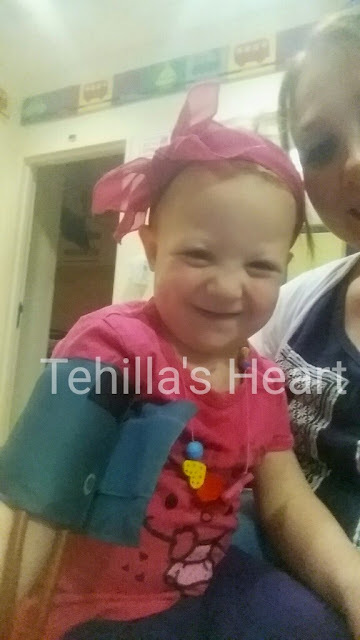 We're smiling with you, Tehilla. Shalom Tehilla, everything will be alright. HaShem loves you and we love you too.